The first John Wick was a remarkable vision of stylish cinematography and fast-paced, brutal, well choreographed action sequences. Many were calling it the best pure action film since Die Hard. Others were calling it a career rejuvenation for Keanu Reeves similar to the one the Taken series provided for Liam Neeson - one that became something of a meta commentary as Reeves, as Wick, angrily shouted “yeah, I’m thinking I’m back!” toward the end of the first film. By now the videos of Reeves showing off his gun skills (seriously, just Google Keanu Reeves shooting) have proven just how seriously he is taking these films, and it shows. A lot of credit must be given to writer Derek Kolstad, who came up with the character and wrote the screenplays for both films, but director Chad Stahelski and his team of choreographers deserve special recognition. He has an extensive background as a stunt coordinator in Hollywood - he even served as Keanu Reeves’s stunt double in both Point Break and The Matrix (among others). Together with his team of choreographers and martial artists - who trained Reeves for months - have a remarkable ability to stage, choreograph, and shoot visually compelling, yet tense and brutal action sequences. It allows this series to rise above so many other action films. 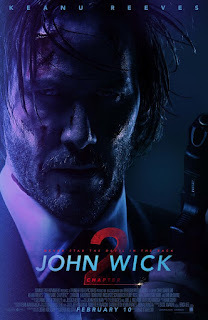 If the first film was like the first Raid film - visually spectacular with mind blowing fight sequences, though somewhat shallow in terms of depth of story - then Chapter 2 is not unlike The Raid 2 - a deeper, more mature expansion on the world John Wick inhabits. It isn’t just a simple revenge film this time, it explores the rules, regulations, and depth of this criminal underworld and how it both helps and haunts John. His reputation as the boogeyman, or the herald of death, precedes him and almost serves as a challenge to his fellow assassins. As we saw in the first film, there is no honor among thieves as it were. Assassins are opportunistic people, always looking for another job if the price is right, even if it means taking out one of their own. That precedent having been set, writer Derek Kolstad uses it to amp up the tension here for Chapter 2. More than that, Kolstad uses it as an opportunity to turn the franchise on its head. No longer is John Wick the hunter, he’s the hunted. It begins shortly after the end of the first film with John cleaning up a few loose ends. The car that was stolen from him had to be reclaimed and a truce had to be struck with the family member remaining after John’s bloody revenge tour. This opening sequence stands as an opportunity to kick the film off with a bang as well as reminding us of what a talented killer he is. Yet again, with his work done, John tries to fade away into retirement, but trouble comes to his door. This time it’s in the form of a “Marker” - a blood oath. John owes rich, shady Santino D’Antonio, a member of the Italian mafia, a debt he intends to claim now that John has shown himself to be working again. D’Antonio tasks him with assassinating his sister, Gianna D'Antonio (Claudia Gerini), so he can take her seat at the “High Table” - a council of very powerful crime lords. While John initially refuses the job, Winston (Ian McShane) - owner of the Continental Hotel - reminds him that the only two rules in their world that matter are: no killing on Continental grounds, and all markers must be honored. However, the personal stakes come in the form of an attack by D'Antonio that burns John's house to the ground, pictures of his wife and all. With this "Marker" hanging over his head, he reluctantly agrees to take on D'Antonio's job. However, to make matters more complicated D’Antonio makes it clear that not only does he want John to kill his sister, but he would be forced to put a bounty on him for doing so. On top of that, this job will inevitably put him at odds with another assassin of similar skills in Cassian (Common), who had been working as a bodyguard to Gianna. And once D’Antonio puts a price on John’s head, even more assassin’s will be after him. Of course, at some point John will have to decide what to do about D’Antonio. After all, he did force him back into work against his will, burned his house down, and put a price on his head. What makes John Wick stand out as an action franchise is the way the action sequences are shot and cut together. Yes, they’re fast paced and the cutting is fast, but every sequence remains totally comprehensible. So many action movies today utilize close-up, shaky, handheld camera shots and fast edits to hide the fact that it’s a bunch of actors pretending to hit each other while hopefully remembering the next couple of movements in the choreography. They result in dizzying sequences that can be hard to follow and don’t stand out in any way, shape, or form. However, these Wick films utilize the extensive training Keanu Reeves went through (he does all his own driving, fighting, and shooting), pair it with very experienced stunt coordinators, and the work of cinematographer Dan Laustsen to be able to make the fights look real without putting the camera too close or relying on fast cuts to blur the action. This is the work of such talented planners and performers that there is no need to hide any artificiality, because they know how to convince their audience without resorting to such cheap tricks. In fact, Chapter 2 looks every bit as good as the first film while escalating the carnage and performing it even more gruesomely than before. Now, to be fair, this film does, at times, suffer from the fatigue that comes from having too many sequences to count. The opening scene is brilliant, and there are some remarkable scenes throughout, culminating in a visually striking hall of mirrors sequence that recalls Scaramanga’s fun house at the end of The Man with the Golden Gun mixed with Orson Welles’s magic mirror maze scene from Lady from Shanghai. However, like a lot of action films, some scenes begin to blur together because there’s only so many ways to do a hallway shootout, or to prove John Wick’s physical prowess at the expense of countless faceless goons. Nevertheless, the majority of the action here is clearly of a higher level than that of your average Hollywood action film and that’s not something to be glossed over. Reeves and company give excellent performances, and it’s certainly nice to see a reunion with The Matrix costar Laurence Fishburne, who is the best of the new additions here. The most compelling aspect of the film, however, is the more deeply fleshed out world of assassins and criminals. We got brief glimpses of this criminal underworld in the first film, but this chapter delves much deeper into it, and its rules and regulations become exceedingly important. When one person puts out a bounty we see how widespread the community of killers really is. There are also hints of how powerful Ian McShane’s Winston is due to his ownership of the Continental Hotel and its various services around the world. There’s also a clear indication of a third film to come in which Winston will likely hold a key role (but really you wouldn’t cast Ian McShane to play such a minor role without expanding on his character if the opportunity arose, right?). The expanded look at the criminal underworld here also makes me hopeful for the future of the John Wick TV show director Chad Stahelski and writer Derek Kolstad are trying to get off the ground. John Wick: Chapter 2 is an excellent continuation of one of the best action franchises in years. It more than solidifies Keanu Reeves place as one of the best action stars in film history, and the franchise is set to expand even further based on this film’s continued success.